Queen of Air and Darkness is going to be published in less than a month – hooray! To celebrate the upcoming release of her final book in the Dark Artifices trilogy, Cassandra Clare just took to her tumblr to share yet another snippet and to also share the title of the first chapter. Furthermore, she announced that she’d be sharing a snippet every single day until we hold Queen of Air and Darkness in our hands. How exciting! Yes, let Emma through! She needs to comfort her parabatai and you all better stay away from Livvy. 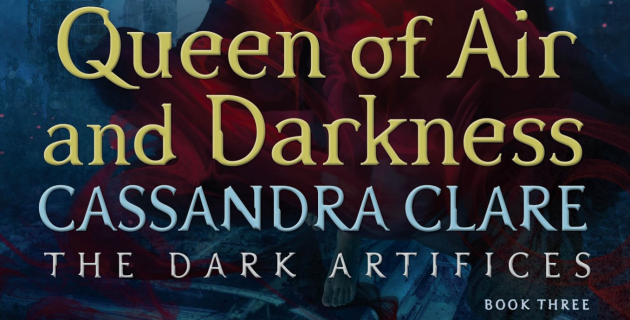 Looks we will begin our reading of Queen of Air and Darkness like we ended it with Lord of Shadows: crying while cursing Cassie for causing us pain. I really hope some of the upcoming snippets are going to be cute and happy ones. I will be reading Lord of Shadows again and will be crying again can’t wait for Queen of darkness I’ve been on pins and needles waiting for its arrival I pre-ordered it in January and it’s been a long wait.